The second book I read via Dailylit.com. Not until near the end did I find out I actually owned the book myself. Easy mistake to make. 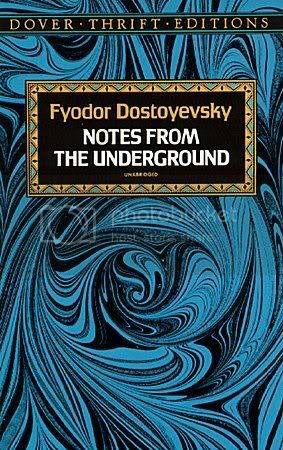 Up until now I have read several Dostoyevsky books, including his masterpiece Crime and Punishment, though all in Dutch. Unfortunately I can’t speak nor read any Russian, which I feel is a huge disadvantage when reading classics from Tolstoy and Dostoyevsky, with Chekov and other waiting to be read on my shelf. Luckily some of the translations I read were done by a good Dutch author, so why bother reading a translation in a foreign language. But as my second choice for a daily E-mail with part of the book, I picked Dostyevsky anyway. I’m not sure if I can call it a hit. Actually I know, it wasn’t. And having read not one disappointing book by him, it must be either the fact I read it in English or the fact I read it in seventy one pieces from a 14 inch screen instead of paper, to blame for the fact that I never really enjoyed the book. I saw the idea of the story, the monologue from the main character needs full attention, not just a couple of minutes inbetween spam for Viagra, some African offering me a thirty percent share of their deceased prime-ministers fortune or the rants of Michael Moore against the Republicans. The story is short, certainly when compared to his other books, the I-person, the author of the notes, has to deal with life and his loneliness, but mostly with his personal frustrations. Interesting, many philosophical debate could follow reading it, hence the book is more suitable for a reading group than for reading via computers.